The Rochester Americans are pleased to announce that the team will induct defenseman Doug Janik and forward Steve Langdon into the Amerks Hall of Fame as the Class of 2019. Janik and Langdon were unanimously selected for induction by the Amerks Hall of Fame Committee and will take their rightful place in the prestigious club on Friday, Feb. 8 when Rochester hosts the Springfield Thunderbirds at The Blue Cross Arena at 7:05 p.m. on Seneca Niagara Resort & Casino Legends Night. Set to become the 63rd member of the exclusive club, Janik spent five seasons patrolling the Rochester blueline from 2001 to 2006, establishing himself as one of the most dominant defensemen in franchise history. Janik recorded 91 points (18+73) over his five seasons with the club, ranking 31st all-time among Rochester blueliners, while also leading the Amerks to four straight playoff appearances. His 376 career games are the third most of any defenseman and rank 14th all-time. Aside from his offensive contributions, Janik was widely known for his strong physical presence and hard-nosed tenacity that became symbolic with his rugged style of play. Janik averaged more than 100 penalty minutes in each of his five seasons in Rochester, including a career-best 196 penalty minutes during the 2004-05 campaign. He racked up 686 penalty minutes as an Amerk, the third most among any defenseman and the 12th most all-time in team history. Following three years at the University of Maine, Janik began his pro career in Rochester in 2001-02, ranking third among all Amerks defensemen with 23 points (6+17) while appearing in all 80 regular-season games. After producing 16 points in each of the next two seasons, in addition to seeing time with the Buffalo Sabres, Janik helped the Amerks to their best regular-season record in franchise history during the 2004-05 campaign as Rochester finished the year with an AHL-best 51-19-6-4 record, winning the Macgregor Kilpatrick Trophy as regular season champions. The Springfield, Mass., native accounted for two 12 points (2+10) that year and a team-best 196 penalty minutes. The Amerks would set several single-season franchise records for the most points (112) and the longest home winning streak which saw Rochester win 17 consecutive home games between Dec. 17 and Mar. 4. The 51-win season would be the second most in any season for Rochester and Randy Cunneyworth, the franchise’s all-time leader in coaching wins, would be named the AHL’s Coach of the Year. Janik had his best season as an Amerk during the 2005-06 campaign, his final year in Rochester, scoring five goals and adding 19 assists for 24 points in 71 games. He would also go on to appear in five NHL playoff games for the Sabres, scoring what would be his only NHL postseason goal. Janik departed the organization the following year and would spend the next six seasons with four different NHL organizations and their AHL affiliates. Janik split the 2013-14 season in the AHL between San Antonio and Chicago before playing one final year overseas. He retired following the 2014-15 campaign having played more than 870 professional games and 251 career points between the NHL, AHL and Europe. Janik is currently in his third season as an assistant coach with the AHL’s Springfield Thunderbirds. Langdon spent five of his six pro seasons in Rochester from 1974 to 1979, and much like Janik, helped the team to four straight playoff appearances, including a trip to the Calder Cup Finals in 1977. In 313 career games with the Amerks, Langdon scored 97 goals, ranking him 20th all-time, and added 87 assists for 184 points. He also recorded 14 points (3+11) in 35 postseason appearances. Langdon’s tenure in Rochester coincided over the Amerks’ five-year affiliation with the Boston Bruins, the team that drafted him 63rd overall in the 1973 NHL Draft. The Toronto, Ontario, native broke into professional hockey with the Albuquerque Six-Guns of the Central Hockey League in 1973-74. Langdon arrived in Rochester the following season, putting up 19 points (8+11) in 56 games while also making his NHL debut that year with Boston, appearing in one game for the Don Cherry-coached Bruins. During the 1975-76 season, Langdon more than doubled his goal output from the previous year before helping the Amerks to their second playoff appearance in as many years under the Boston affiliation. After leading the Amerks to the Calder Cup Finals in 1977, Langdon enjoyed his best season in 1977-78, finishing third on the team with a career-high 30 goals and fifth with 57 points, leading the Amerks to their fourth straight playoff appearance. He would play one final season with the Amerks in 1978-79, scoring 25 more goals, appearing in all 80 games while serving as team captain. He closed out his career in Rochester ranked 35th in scoring among all-time forwards. He went onto to appear in seven career games with the Bruins, recording one assist, as well as three games for the Broome County Dusters of the North American Hockey League. Langdon’s contributions to the organization extend off the ice as well, and for the past several years, has made a strong commitment to give back to the Rochester community through his work within the Amerks Alumni Association. After retiring from the game as a player, Langdon served as a coach and administrator in Rochester Youth Hockey for over 20 years. He also founded the Stephanie Langdon Hockey School with the help of the alumni. Over a five-year period, the program raised over $30,000 for the Golisano Children’s Hospital, in memory of his daughter. For the past several years, Langdon has been instrumental in building and maintaining a network of local Amerks Alumni and has spearheaded numerous charitable endeavors, most notably the Thomas M. Nichols Scholarship Fund, which awards a scholarship to a local high school senior that actively participates in Section V hockey and displays excellence in their work ethic, character and determination. He recently fostered a relationship between the Alumni and Oasis Adaptive Sports, a local organization that offers instruction, equipment and support to disabled military veterans in a variety of recreational sporting activities. Langdon, with the assistance of alumni members, introduce hockey to the veterans and their families by providing on-ice instruction through their “Learn to Skate” program. His philanthropic and outreach efforts also extend to the Veteran Outreach Center, the Finger Lakes Donor Recovery Network and the annual Amerks Alumni Golf Tournament, which just celebrated its sixth year, and continues to generate thousands of dollars in support of other local charitable organizations. 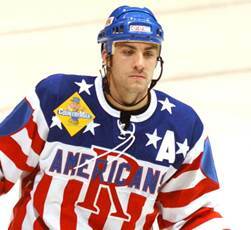 Be the first to comment on "Doug Janik, Steve Langdon to enter Amerks Hall of Fame"